It’s sunny and nice outside but it isn’t all great. Here in Nagasaki, Pollution (PM2.5) is very bad. I thought it was just fog but no, it is all pollution! “It’s sunny but we can’t play outside because of this." Kate sensei is very upset too. Now, we are doing homework. 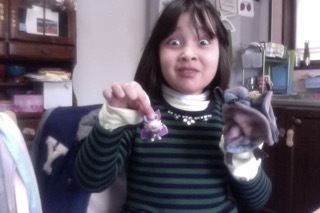 I got done with homework and I am writing this blog. What she wrote seemed very similar to the one she wrote at school, so I was kind of like “HUH? ?” but I kept my mouth shut. 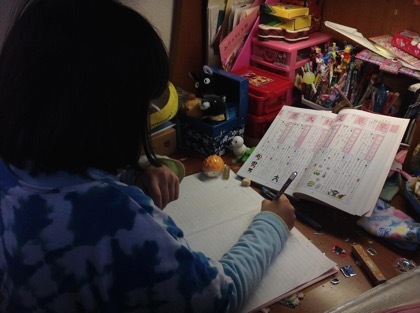 After the diary, she is practicing Kanji. Kate, please tell us the word for the day. “Huh? What is it? Wait! What’s wrong? Oh, our fans again? They are handful, aren’t they!?" “I’m going to play Cat’s Cradle." She is great as always! I hope all of you are doinf well too! Hello! Today, I’m going to talk about the mask Kate made. Please take a look! It’s a pretty unique mask. 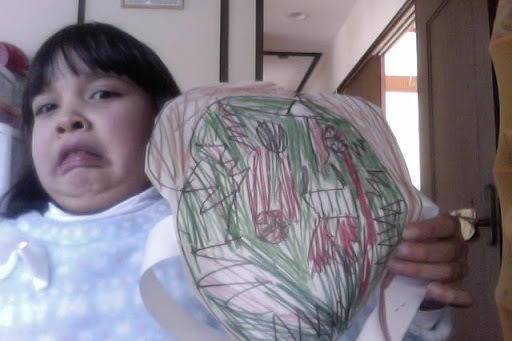 “It’s a Zombie Mask.” That makes sense. I told Kate that her mask has a white triangle on the head which is a common thing for ghosts in Japan. “Well, mom told me that maybe there’re zombies like this too, so, there is a reason for purpose.” Actually, here, she meant to say, there’s no reason to worry. I tried explaining she said it wrong and tried not to laugh too much. Afterwards, I asked her for the word of today. She said “Impossible. Because it’s impossible. I already said it. Okay. The end. How was that? I told you it’s over!” She got a little angry. There’s school tomorrow. Weeks are going by so fast. Not sure what I am going to do today. Last night, it rained here like crazy! There were thunders as well which made Kate really scared. When we woke up, it was rainy but no thunder, so that was good. We’ll eat lunch, play guitar and make some chocolates. “I shall make but eat lots too." That sounds dangerous. I will be looking out. So, here is Sensei’s word of the day. “Oh, wait. I am writing a diary…. Oh, don’t write that." Ha ha! I already typed that. Kate, is studying now which is a bit rare. Have a great Valentine’s day everyone!!! 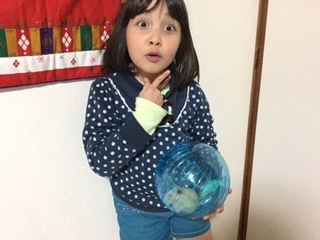 休みだったのでお泊まり会！No school, so we had a friend over! yesterday, a friend came over for a sleepover. We stayed up until 11 or so, played game, hanged out, etc. We woke up a little late and went for a walk, took some printclub pictures. Such a fun monring. She went home around 11 or so, after that it was like a usual weekend. Played guitar, finished homework, played lots. Kate is still really energetic. I envy her. Well, maybe she will cheer me up, so I will ask her for her wise comments. Interesting comment. It didn’t really make me fell energized though. Well, she seems like she wants to run around, so I will go along. Hello, everyone! It’s sunny in Nagasaki… that’s what I want to say but it’s a bit cloudy. I was hoping it would snow, so I am a little sad. Anyway, I belive Kate-Sensei is studying hard. 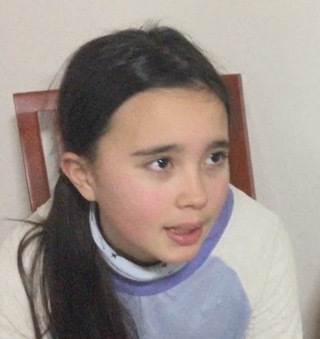 She is at grandpa’s place, so I am not sure but I believe she is. I am writng a blog while she is studying. I actually found something interesting. 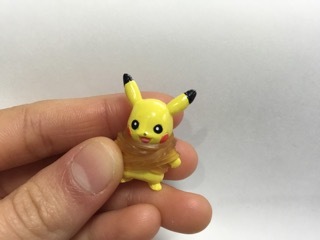 It’s Pikachu and you might think, it looks a bit strange. I think the photo will surprise you. There’s rubber band all around him. At first, I thought it was a trap but I was wrong. I guess this was Kate’s idea. I finally understood. Pikachu’s hands are free if you look closely, so it can’t be a trap. 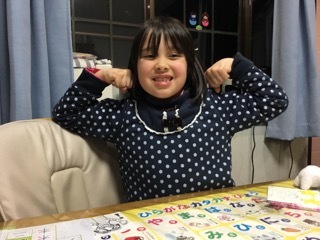 Well, Kate sensei’s still at grandpa’s, so there is no word for the day. Hello, everyone! Sorry for not updating my blog lately. Today, I want to tell you funny things Kate said. But it still kept burning. So, I guess this story is about a bad guy who got caught and put in fire. Kate thought getting burned and getting a tan was the same thing. Here is another time when we were recording. Out of no where, she said. I have no idea what she wanted to say there. When we were driving we saw a bald man. This was what Kate said. I wanted to tell her to shut up but it was too funny, I started laughing. She is always making us laugh. Here is her word for the day. “hmm……. What should I choose to say"